Standing at the start line of the Greenland 50K just minutes before the gun went off, I finally made my decision on how I’d approach the race. If you had asked me what my strategy would be the morning of – the day before – a week before – all would have solicited different answers. My original goal was to attempt a sub-5 hour finish. However, after having a sub-par day at the CURE 50K just two weeks before and experiencing some pain in my feet, coupled with a 3-day business trip in Boston landing back home less than 10 hours before the gun went off didn’t leave me feeling too optimistic for the race. As I milled about the start line chatting with other runners, a friend asked me what my plan was. Without hesitation I said, “I’m just going to go for it.” Whoa. No clue where that came from. Perhaps it was that wise subconscious that finally quieted the millions of negative and worried thoughts I’d had for the past couple of weeks, or perhaps it was my internal frustration coming to a head and making a decision on its own. Who knows. What I do know is that I ran a smart, steady race that will go down in the books as one of my favorites for many different reasons. 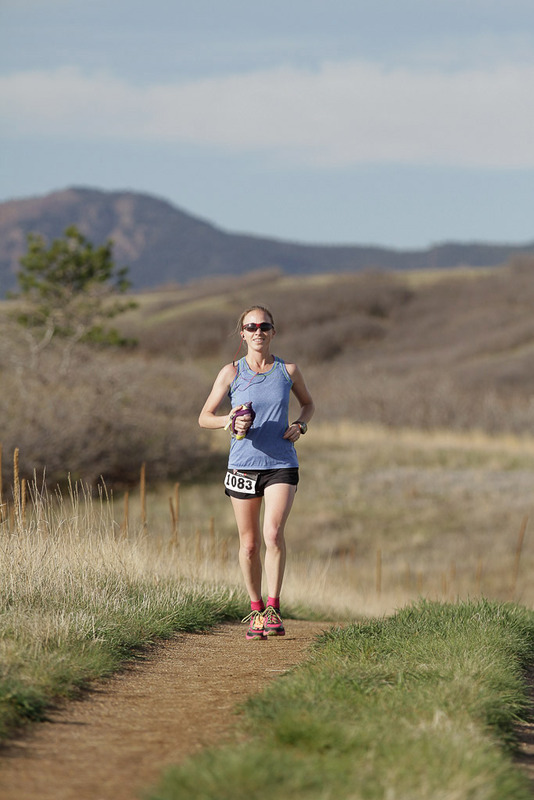 The Greenland 50K is a loop-style course within Greenland Open Space, just south of Larkspur. 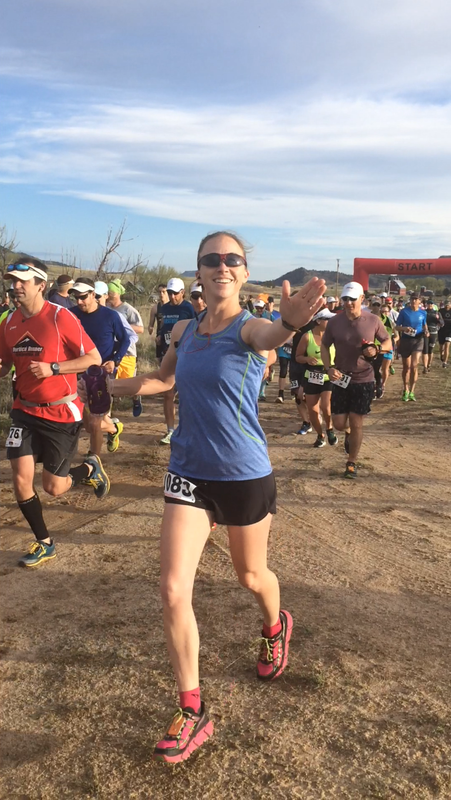 The 4, 8-mile laps are run on dirt trails and include 2,280′ of elevation gain and loss. To be honest, I’m still on the fence about lap-style courses. On one hand, they are great when it comes to strategy and bench-marking your performance throughout the race. On the other hand, it’s mentally draining, especially in those first couple of laps. With regards to this race, I was very happy about the 4 laps because I knew the course well and definitely knew when to push and when to hold back. That, and I got to see Pete several times, as well as have my own nutrition available. All smiles at the start – let’s do this! The start of the race and the first lap went by extremely fast. I decided to wear Hoka’s (which I typically only wear for recovery runs and long runs on pavement) because of the aforementioned foot pain I’d had. They ended up being the perfect choice, and while I still had some pain in my right foot and toe, it didn’t worsen at all throughout the race. It was cooler at the start, so I started off with water only in my handheld. When I checked my watch at the turnaround I made a mental note of my split time. I knew I was ahead of goal pace but didn’t feel like I was pushing myself enough to explode later. I grabbed some Tailwind in my handheld and a Clif Energy “squeeze” and headed out for lap two. I continually checked my mile splits and knew I was ahead of my goal, and started thinking about the nice “cushion” I was creating. I told myself to stop calculating every split and wait for the halfway mark. (On a side note, I’m pretty sure I should have gone into mathematics with how quickly I can calculate times and splits, or maybe that’s just a runner thing…). I came through the halfway point and the end of lap two in 2:24:03. “Holy crap, I have a 12 minute cushion. If I can stay consistent these last two laps and not completely explode, I should be able to do this.” I dropped my music and my shirt (it was much warmer at this point, especially with the exposed course), grabbed some more Tailwind in my handheld and another Clif Energy “squeeze,” and headed back on the course for lap 3. I failed to mention earlier that there is also a 25K and 8M that start after the 50K. 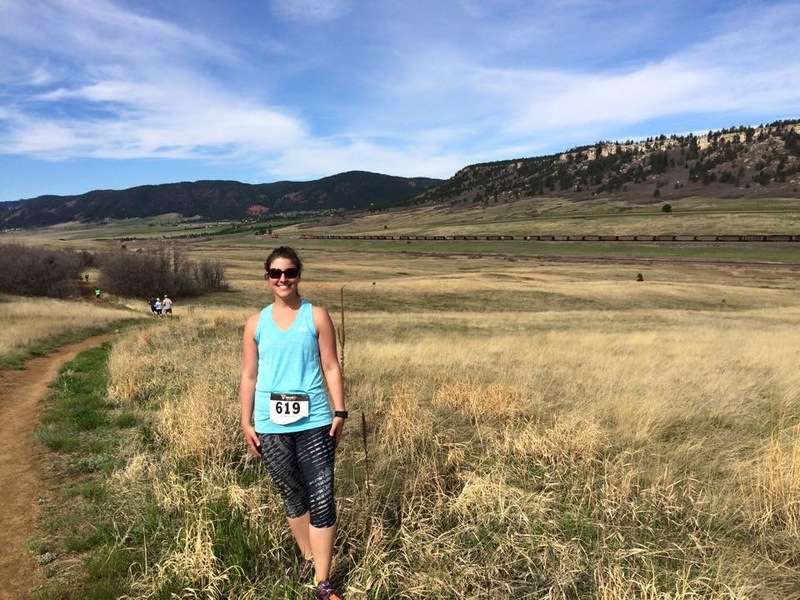 A few weeks prior to the race I talked my SIL (sister-in-law) into running the 25K. 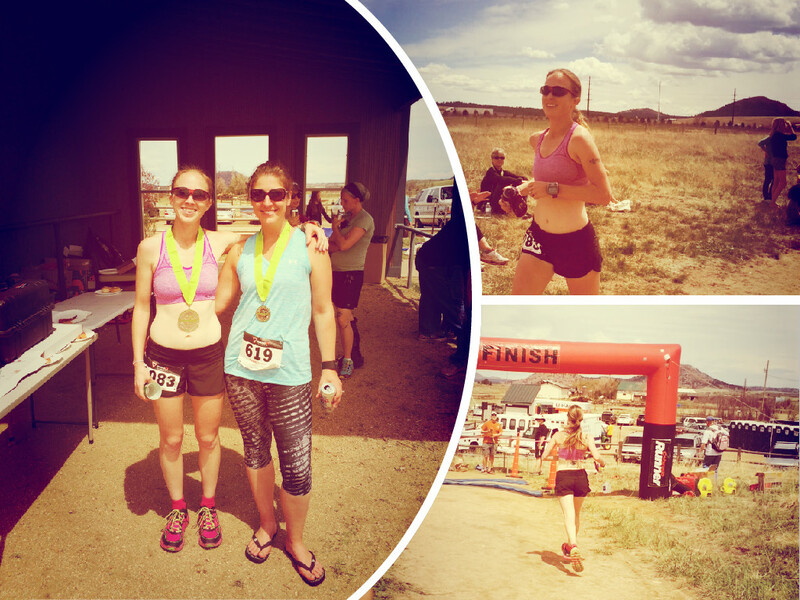 It was her first trail race and longest run since having sweet little Jackson! MoHo before her first trail race! Right around mile 19 I caught up with Mo. She looked so good and gave me a huge boost! I saw her about a mile before the long ascent, which is exactly what I needed to keep me going strong and steady. I knew my pace was going down slightly and was eager to hit the downhill. By the time I hit the turnaround for the final loop, I was nervous, excited and ready to finish. I grabbed more Tailwind, another Clif, kissed Pete and mentioned that I was on pace and excited, and headed out. Lap 4 was the hardest, naturally. My legs finally had some fatigue in them and my stomach wasn’t happy with me. I began calculating again, knowing exactly how much time I had to work with and still hit my goal. This is when I walked a few of the steeper climbs. My breathing was beginning to suffer, and any time I hit a climb of some sort, my heart rate sky rocketed and my breathing was out of control. I started to get nervous at this point – was I going to make it? 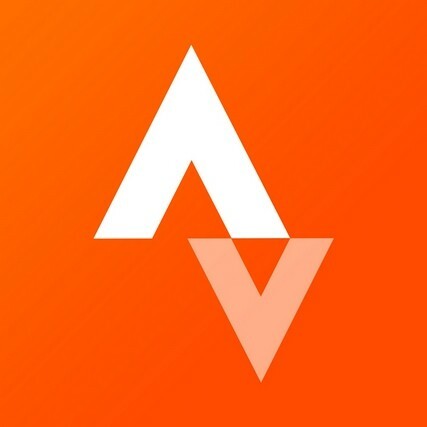 I hit the final big ascent at mile 26 and started to actually get angry with myself. Oh, the internal monologue of a runner. If only we had recorders during these moments! I crested the last climb and picked it up on the downhill. The BZZZZ of my Garmin told me that I was going to do it; I was going to hit my goal! Those final 3 miles felt like the longest victory lap ever. I crossed the finish line in 4:52:30 (my Garmin read 30.8 miles), good for 28th overall, eight female and 2nd in my age group. Over a week later, and I’m still a little surprised, but I don’t know why. I put the training in, I had the support and I gave it everything I had. I think there’s still a little piece of me that doesn’t think I’m capable of achieving these types of things. It sounds silly, doesn’t it? You put everything you have into something, and yet, are still surprised by the outcome. I suppose that’s me. But maybe it’s a good thing, because it will always be the biggest motivating factor in my life, not just running.